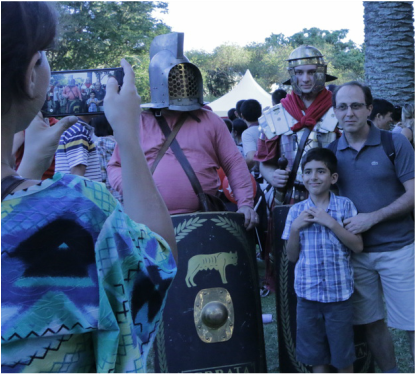 Roman legionary photos - people like getting selfies with a Roman or Gladiator. Some tips for a good pic - always ensure that your helmet is on straight and level with the eyes (nothing looks worse than a crooked helmet). Keep the crest straight too, so make sure it is tied down securely prior to the event. Hold the sword flat to the camera, as swords held edge-ways are invisible in the picture. The kids can hold the sword provided it is a round-tip. Keep your cloak swept back off the shoulders to display your lorica segmentata. Hold the shield foremost to display our website-address (so that people later viewing the pic know how to find us). ​Sometimes the crowds are too large, and unfortunately due to time constraints we may need to march on with photographers still chasing us. 1. Tunic - white tunics usual for parade display (but agree with the rest of the group). Red tunics for combat. On weekend camps it may be necessary to wear a mix of tunics. Do not wear shorts that can be seen protruding below hem of tunic. Wear sports-underwear because quite often the crotch might be seen. Use a rope or belt to blouse the tunic to sit just above the knee - any higher is a slave, and any lower is a woman (it is a common minor punishment in the Roman army to make a soldier stand on guard duty in an unbloused tunic). 2. Caligae - wear proper Roman footwear. Bring socks is you need them, or even foot bindings. In winter it is acceptable to wear leather and fur-lined boots. Some events we can't use caligae hobnails because of polished floors making a safety issue. In this case you need a second pair of Roman footwear without hobnails for indoor use. If you don't have these yet, please wear brown leather sandals that look as close to Roman as possible. Lorica segmentata - If you are moving a lot, and in hot weather, then only a tunic underneath may be fine. But on long marches or standing still for long periods, then you will probably want some type of padding for the shoulders, either a subarmalis or even simple folded hand-towels as padding on the shoulders. This padding prevents pinching on the nerves and muscles. Whether your armour lacing is tied individually, or is "power-laced" in one long leather thong is a matter of personal choice. Like a lot of things, there is no definitive evidence on this, so it is left to the individual soldier's discretion. Chainmail - Chainmail comes in various weights and styles, so make sure it is fit for the intended activity. Riding a horse you want special lightweight chain, but going into a sword fight you probably want the heaviest you can get. We do not mind if it is riveted, butted or both, provided it looks the part - so no modern-looking plastic, aluminium or stainless steel. Styles include sleeved or sleeveless, and finishing at the waist or lower on the thighs. Ideally, to distinguish as Roman it includes chainmail shoulder lapels, leather-edged, and joined by a brass connector across the chest. Leather - Leather cuirass or subarmalis is fine for comfort if you have difficulty with the weight of metal armour. 4. Red scarf - to protect the neck form chaffing. Wear more than one if you need it. 5. Sword - SAFETY FIRST! Sharp swords are okay for your own private use, but any sword that you will be showing to the public or using in mock combat must be blunt-tip to the roundness of a dollar coin. Safety is paramount. It is okay to let a child hold a blunt sword while mum takes a selfie, but please use your judgment. In the majority of cases it will be fine, but if the child is too small or appears aggressive then use your discretion to tell them sorry. Make sure your baldric is at a comfortable length, on your right, and the sword is easy to draw from the scabbard. It pays to attach your scabbard to the baldric so it points slightly forward with the sword handle. Check the sword handle is solid on the tang, and nothing has worked loose that needs repair. Also check for burrs on the sword edge that will naturally develop from sword-fighting, as these can be sharp enough to rip skin if you aren't careful, and should be ground smooth. Any burrs should be hammered flat again against iron, because this fills them back in with the same metal nicked out and then it usually only takes a rub of sandpaper for a finish to a nice smoothness. 6. Balteus (or cingulum) - this is tied around the waist over the baldric, so that it helps keep your sword in place, and the baldric stops the balteus falling down. The ideal is to tie the balteus so tightly that it stays fixed on well-fitting armour, but this is not always possible. Especially if wearing a pugio dagger, the added weight can pull that side of the balteus down. We want the balteus to be worn level in all situations, so it may be that you can use your armour thonging front and back to tie the balteus in place. Also a leather thong or wire around one loop of seg can be used to tie the balteus in place by the pugio. Some soldiers use special brass hooks, either fixed, or hung on a seg loop to hold the balteus in place too. 7. Helmet - should sit comfortably on the head and straight above the eyes. Nothing looks worse than a helmet on an angle. Strategically gluing internal padding each side to fit the exact shape of your particular head is a big help in keeping the helmet straight in all combat situations. The method of tying is at the soldier's discretion, sometimes the thong is connected to the rear neck-guard eyelet, and sometimes a bolted on chin-strap is used. You will probably need a padded cap to make it fit comfortably. Some soldiers wear fur caps, and the helmet just slips on and off the head, but these can get hot in summer. Some helmets have built-in padding, but often your head will sweat, and this can make the padding hard to keep clean - therefore leave gaps between padding as air-channels to allow some ventilation. Make sure your helmet is clean, polished and rust-free as this is the main thing people look at. Don't leave it sitting in direct sun, as it will become very hot, and even when wearing it you want to use the shade wherever possible. 8. Crest - if wearing a crest, which does look good in a parade, make sure you have the brass crest-connector. These are one of the most common items to get lost! Use strong leather thonging to tie the crest to the eyelets or hooks. In heavy winds or a long day it pays to wire it on. Leather thonging can snap, so keep some spare, but check before hand, because nothing is worse than trying to do a field-repair in the middle of a performance. If doing maneuvers that require holding the shield above your head, you really want to remove the crest if at all possible. 9. Cloaks - these look good worn on parade, especially if we all have them. They were connected on one shoulder by a cloak-pin, or on both shoulders by circular torcs. Torcs are expensive, and cloak-pins very often break, so in a pinch you may need a simple knot to hold the cloak in place. If wearing segmentata then it is good to tuck the cloak back under the rear shoulder plates to stop it blowing all over the place. 10. Pugio - this is optional, but a Roman doesn't feel fully dressed until he has his dagger. These should not be sharp, and it is okay to show a blunt pugio to the public, but it is probably best not to let them handle it. 11. Greaves - these should be comfortable for the anticipated activities, and will probably need padding to protect the legs, and especially where the weight of the greave sits directly on the top of the foot. Try wearing these around home first to make sure that all is well. 12. Gloves - can be used as knuckle protection when holding some of the shield handles in the boss. Essential some sort of heavy-duty protective glove if going into mock sword-fights to safeguard your sword-hand. 13. Bracers - leather bracers used to protect the wrists and arms are optional, but make sure they look Roman. Critics will complain that there is no evidence bracers were ever used, but an hour swinging a shield and sword around might convince them that some kind of protection is a pretty good idea. It can be viewed as a safety matter, as we don't want you bleeding all over everything. 14. Manica - metal arm protection. Wear it if you want, just make sure it fits well, and has padding to stop chaffing. 15. Shields - both parade and combat are provided and maintained by the club, but you can also buy your own personal shield for private use as well. Shield-covers. 16. Pilums - real pilums for carrying in parades, and dummy-pilums discharged in mock combat bouts. Stay aware of where the point of your pilum is sticking at all times to avoid accidental injuries. 17. Miscellaneous - Roman leather satchel or pouch to carry items on your uniform. Large carry-bag to transport your gear and keep it all together. A change of clothes. A towel. Plenty of drinking water. Repair kit. The Club will provide the Medical Kit, and also an Emergency Repair Kit of various leather-thonging etc for when things unexpectedly snap, but bring your own too if you want. Also polish and rags is a good idea for last minute touch-up. Sunhat and sunscreen. 18. Weapons inspection - confirm that all weapons are safe before the event, and again at the event. All spears must be mechanically attached to the haft with a metal-pin. 19. Blood-dagger and blood-packs - Agree before hand the extent of use. Pete's care, make sure all ingredients and enough time for preparation. Second a helper if deemed necessary. 20. Centurion - sideways-crest, sword on left, subarmalis, chainmail, medallions, vine-stick, evil-stare and loud-voice. 21. Signifer - the standards, dress and wolfskin as required. 22. Archery - bows and blunt-arrows as required. Quiver. 1. Legionary tents - check have all poles, pole-connectors, guy-ropes, tent-pegs, spare ropes, and hammer. Check before hand for any fabric-rips and stitch-repair or apply patch-reinforcing. Apply any waterproofing, although generally we are trying not to get these tents wet if at all possible. 3. Pop-up tents - not part of the Roman Living History Display at all, but often useful due to quick-erection capability behind the display as waterproof emergency shelter, or just as changing rooms and gear storage. They can be erected on sealed areas, and sometimes among a whole row of pop-up tents. It depends on the particular event if these are required. 4. John's Centurion tent - we are going to look at simplifying the erection process of this tent by removing (hopefully!) the need for so many bolts that makes so fiddly and time consuming. 5. Imperial tent - we are constructing a large waterproof Imperial tent, details to come. 6. Wooden tables and benches - Vic's period trestle-table, and Lisa's wood outdoor table and four (2 person) stools. Any extra folding camp-stools. 7. Display tables - foldout plastic trestle, needs a cover. For Gladiator gear and Roman helmet displays. 8. Pell - Pete's wooden sword-training post, and wooden practice swords. 9. Sudes - wooden tri-spikes for camp perimeter. 10. Ropes and posts - for roped off areas, delineating camp to keep public back, and training areas. Bring plenty of rope. 11. Signs - any signs needed to publicise various activities, general promotion, do-not-touch, etc. Any stakes or means of holding and positioning signs. Card-holder for club cards. 12. Blankets and sheets - needed to cover non-period gear. Bring as many as possible. 13. Water - bring plenty of drinking water for the group, buy-in-bulk. Individuals should bring their own water too. Use period drinking cups, or leather bags to disguise plastic. Sunhat and sunscreen. 14. Roman items - period eating and drinking plates, cups and utensils. Pots, pans and jugs etc. Wicker-baskets and timber boxes for storage. Leather mats and rugs. Paraphernalia such as scales, scrolls, hourglass, etc. 15. Club shields, pilums and armour - both for field-use and display around the camp. Armour-stand for seg or chainmail. Spare helmets and gear for display. Any swords handed to the public must be rounded-only. ​16. Medical kit - maintained by Lisa. Doesn't hurt to have individual medical supplies either. ​17. Ballista - static display or demonstration. Bring the firing-bolts. 18. Sound - speaker system if required. Music if required, portable or by speaker. 19. Props - wooden longsword, blue face-paining, blow-up axes, Mars bars, etc. Power required? 1. Gladiator gear - each member check they have the correct gear for their allotted part. Rudis bring his stick. 2. Blood-dagger and blood-packs - Agree before hand the extent of use. Pete's care, make sure all ingredients and enough time for preparation. Second a helper if deemed necessary. 3. Weapons inspection - confirm that all weapons are safe before the event, and again at the event. All spears must be mechanically attached to the haft with a metal-pin. ​4. Miscellaneous - Carry-bag to transport your gear and keep it all together. A change of clothes. A towel. Plenty of drinking water. Repair kit. The Club will provide the Medical Kit, and also an Emergency Repair Kit of various leather-thonging etc for when things unexpectedly snap, but bring your own too if you want. Also polish and rags is a good idea for last minute touch-up. Power required? 5. Props - fasces, rubber swords, image of the gods, black/purple robes, kids helmets, Mars bars, trumpet, drums, etc. 6. Sound - speaker system if required. Music if required, portable or by speaker.